Genoas in a cruising inventory usually comprise of one, or a combination of, the following sails; Roller Furling Genoa, Yankee and Staysail. Our sails come complete with all of the standard features you would expect with a new sail, such as sail bag, adjustable leech line and tell tales etc. In addition, all of our Furling sails come with a UV Suncover along the leech and foot, as well as a rope luff to help flatten the sail when partially reefed. On most boats we usually recommend a Furling Genoa should be approx 135% overlap, or about the size of a standard #2 Genoa. We have found through years of experience anything bigger than this becomes quite inefficient once you start reefing the sail down. If you also plan on doing some racing with the boat and think you will need a bigger sail, then it is advisable to have a dedicated 150% #1 Genoa which you can then save only for racing. This means you don’t wear out your #1 Genoa by using it all the time for Cruising and vice-versa with your Furling Genoa. This is a sail with a very high cut clew, usually sized at around 100% - 110% overlap.The high clew means the sail can fly away from the boat when eased sheets, so it is an excellent sail for Reaching and is therefore most commonly used as an offshore sail. Due to the height of the clew, we bring the leech line over the head of the sail and down the luff to make it adjustable at the tack. 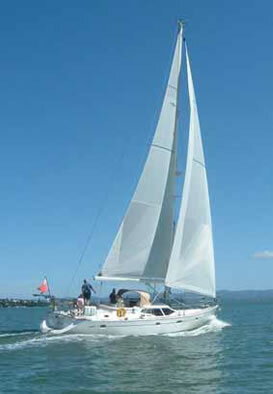 A Staysail is usually only seen on boats larger than about 45 feet in length. This is because you need to have a large enough slot between the mast and the primary forestay to accommodate the intermediate forestay. If this gap is too small and you try flying a Staysail in between the Main and Primary Headsail, then you won’t get an efficient slot effect between the sails and may actually harm your performance. 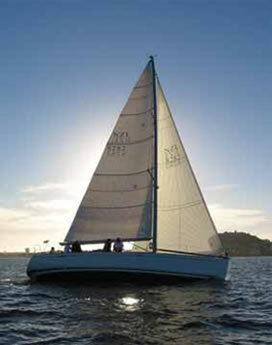 However, if that slot is big enough, then a Staysail can be very beneficial to the boat speed. A Staysail will work particularly well when flown inside a Yankee, as it will fill the gap very nicely and create another slot between the sails.